An interesting trait about Filipinos is that we're very resilient. We've been through a lot and we always keep our chin up. Here’s are some of my favorite posters that circulated online. My favorite is on top, third from the left. 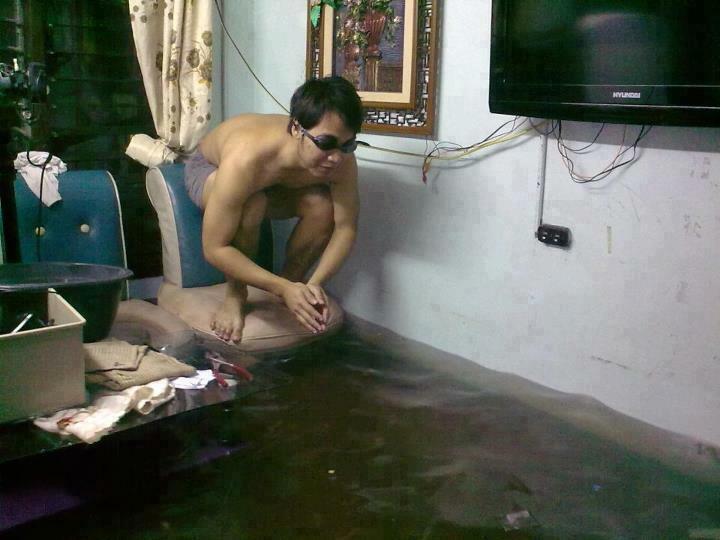 Life goes on, even during the flood. It’s fascinating how Filipinos find reasons to smile. This one made me laugh really hard. Very apt for the Olympics! 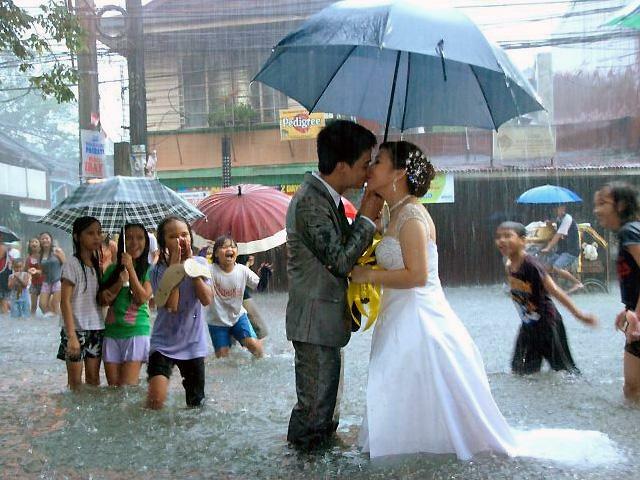 During the height of the rain, I mentioned to friends how it would be devastating to experience flood on one’s wedding day. But here’s a couple who embraced it and tied the knot in water. Salutes to you! "For better or for worse." During this time of crisis, it's also heartwarming to hear stories of courage, togetherness, and acts of selflessness. 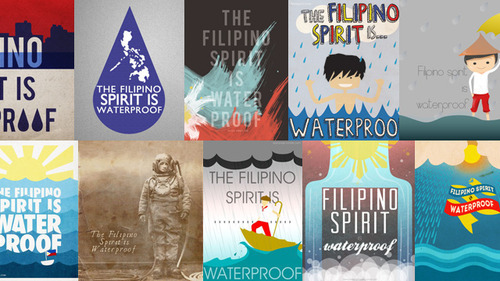 It further affirms that indeed, the Filipino spirit is waterproof. Indeed, RESILIENCE is one treasured trait of Filipinos. But after equating this word to so many smiles and witty antics amidst these heartbreaking events, aren't we starting to make this word synonymous to COMPLACENCY? I don't remember seeing Japanese smiles anywhere while they dealt with their most recent catastrophe, but they were able to rise from the ashes... and rejoiced afterwards. After this turmoil, will we truly recover, or will we just go back to our usual ways? 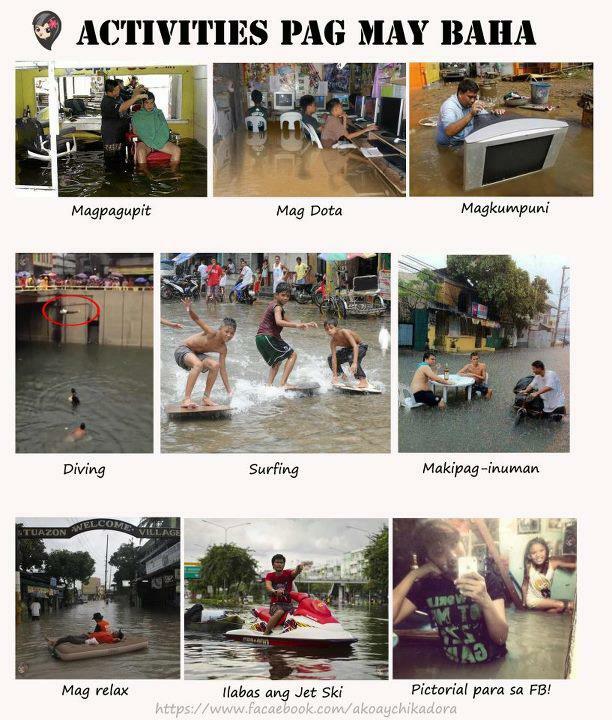 Mga kababayan, yes, never fail to look at the brighter side of things... pero 'wag natin kalimutan bumangon...at MAGBAGO. Only then will we become a truly RESILIENT nation. And I think we are! This is the reason why I don't think being resilient is synonymous to being complacent.. though sadly, for a few, it may be. I read that the government is starting to do something about trying to deal with the floods. Being realistic though, this won't happen overnight. Perhaps not even in our lifetime. Just look out to EDSA. There's so much to do. Little by little, we'll get there. And for the people who were affected by the recent rains, I'm glad that some have fleeted their homes already. Although there will always be those who remain to stay where they are, I'm sure there is a deeper reason that goes with it. It's not that easy. For some, it may be from the clutches of poverty.